Hannah Fry, the author of Hello World has two characteristics that make for wonderful writing and reading: an in-depth knowledge of her subject and the ability to translate complexity into easily understood contents. In this nonfiction book as a professor of mathematics at University College London, she tackles the subject of algorithms as the heart of computers and artificial intelligence. While sounding esoteric, the topic is fascinating. The title Hello World may be familiar to those who were thinking about computers in the 1970s. The phrase was introduced in a programming textbook when at a time when personal computers were first used to communicate with others—an innovation that would forever change our lives. An algorithm is defined as “a step-by-step procedure for solving a problem or accomplishing a task.” By analogy, a kitchen recipe, an IKEA instruction manual, or a self-help video on YouTube would all technically be algorithms. In terms of computers though, algorithms are a sequence of mathematical operations using equations, arithmetic, algebra, calculus, probability, and logic translated into computer code. There are virtually an infinite number of algorithms already in use, each with its own idiosyncrasies. We never see these algorithms, although they work “behind the scenes” telling the computer what to do. As users we simply feed in data/questions and receive an answer or endpoint often not knowing how these miraculous black boxes accomplish the task. Hannah Fry’s overriding thesis is that machines (i.e. computers) do not “think” as much as they follow sequential instructions. Humans must write these instructions and place them in the proper sequence. Human coders, with all their strengths and foibles therefore, still play a central role in writing these algorithms. Depending on skill and foresight, algorithms may have “bugs” that cause the machine to malfunction. There also may be unintended consequences when instructions are erroneously repeated ad infinitum, or when instructions are applied to disparate groups of ideas, objects, or people for which they were not intended. Predicting which criminals will re-offend and/or break probation/parole. While computers can already predict with some accuracy the neighborhoods in which crimes are likely to happen in the next 12 hours, they can do very little to assist in preventing these crimes. Inspecting pathology slides or X-rays for cancerous cells and tumors. The computer already does this more accurately than humans and considerably faster. Piloting safely our new self-driving cars and trucks. Guiding the buying and selling of stocks and bonds. Most of the transactions on Wall Street are already accomplished through this methodology. Producing music, drawings, paintings and other “artistic” works. While these productions can be created, “great art” is not likely. This text does not intend to enumerate the potential risks of artificial intelligence, but does a good job at helping us understand how even the most sophisticated computers operate. Ultimately the author espouses that the combination of humans plus machines is the safest and most progressive way to organize and operationalize our future. 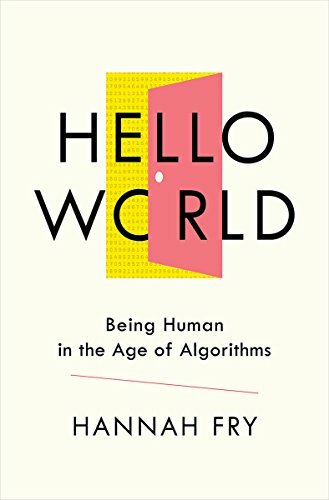 Hello World looks under the hood of computers and is a good read for everyone about our “now” and our near future. Christopher M. Doran is a staff reviewer at New York Journal of Books.